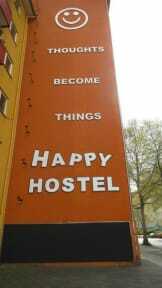 HappyHostelBerlin was opened in April of 2014. This new, small hostel is a family business, thus is corresponding with us. Our guests will be greeted and treated as family and friends. Our hostel is in a quiet yet central location, 10 min walk from the main train station and in walking distance to many attractions. Cozy restaurants and bars, supermarkets, breakfast cafes, bakeries, shops are available in the immediate area. 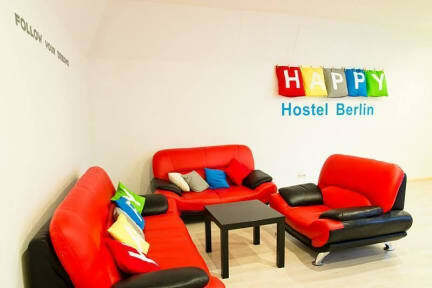 Our hostel is located in the touristic center of Berlin. HappyHostelBerlin offers its guests cozy rooms, from 2 people room with bathroom to 8 people. We provide you with shared bathrooms, self-catering kitchen, living room with TV and access to free WiFi. We guarantee low prices, great atmosphere, perfect location, so you stay in Berlin can be a real pleasure. Cancellation policy: 72 h before arrival date. Payment upon arrival by card or cash. Check in from 14:30 to 23:00 . The heart of good hostel is clean, centrally located, has all the facilities you might want and is very affordable. The only small thing I could fault were the pillows which weren't particularly comfy, other than that we were given free clean sheets and towels upon arrival and made to feel very welcome. Nice hostel probably needs more security of bags in rooms such as individual lockers and bigger communal space otherwise good. Chose this hostel based on the location, which is close to the central station. The location is good, has a store nearby. However the overall atmosphere and facilities were not as decent as expected. Very small rooms, not properly cleaned. Bedsheets cost extra, and even then they could not provide with proper ones. Mostly nobody at the reception, had to ring the bell for 5 minutes until somebody came. No wifi in rooms. Poorly equipped kitchen. Overall fine, but not enjoyable. Unexpected experience considering the pictures we had seen. Not a nice experience as there were people in our room that had spread all their stuff across the room. They had empty bottles, food packets, clothes sprawled all over the floor. Uncomfortable experience and glad we only booked two nights instead of the three we had meant to book, the second place we stayed was exceptional in comparison and similar value. The building is really old and seems that no one takes care of it. The beds/mattresses are really bad, super noisy and uncomfortable. The location is not a big problem, but you can get there only by bus, from public transportation. And although you get a key, the room is never locked (because of the other guests). Where to start. Maybe I should begin with the unfriendly face at reception mid argument with another guest as we walked in, shouting obscenities at each other. Or maybe I should begin with the condition of the living spaces. The matresses were uncomfortable, stained and stank and it didnt help that we weren't provided with any bed clothing despite paying over 20e per person for the night. The common space in the Hostel was also atrocious lacking basic necessities(Utensils/Plates). Disgrace. The hostel looked nothing like the photos. Our room was old and stank. Dimly lit hallways/stairways. People leaving doors open. No lockers in the rooms, worst beds I have slept on in a long time. Only good thing was the location to the train station and some good value restaurants nearby. Worse hostel in the world probably. Indelicate staff, facilities old and disgusting. Please don't go there.